As we worked to develop our lighting kits for the LEGO Disney Castle, we had several customers tell us they planned to display their Castles on rotating turntables. These are heavy-duty models originally designed for TV's, but they work well for large LEGO models also. After doing some testing with our custom-made micro slip rings (which allow wires to rotate a full 360 degrees, meaning you can locate power for your lights outside of the model and still rotate it all the way around), we found they were a perfect fit for both turntable models our customers used. This model fits the Castle well, and it will also work for LEGO Modular Buildings and other sets. The advantage of this model is that it has a flat back, which makes it better suited to support all parts of the Castle than a standard round turntable. We will be working on installation instructions for both models soon, and will have the DIY kit for sale on our website soon. If you would like to order a pre-installed kit, please send us an e-mail through the Contact form on our website. Please note that, due to the large size, heavy weight, and odd shape of these turntables, shipping costs will be very high. These items do not qualify for free shipping, and they must be purchased and shipped separately from other items on our site. 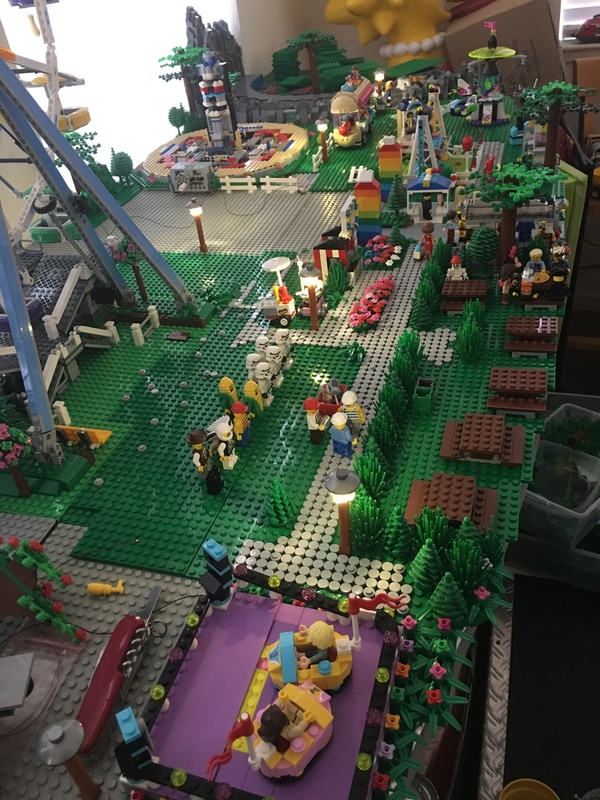 I'll update this post with product costs and shipping costs soon, but I just wanted to start a new Forum post dedicated to the turntable idea, since it was so popular among our customers and also with visitors to Brickworld Chicago last weekend when we demonstrated it with our Castle. One last note: some customers have requested a motorized option for both models of turntable (ideally, made of LEGO parts). While this does sound cool, we're going to defer that until a later date, until we have time to thoroughly research and test options. In the meantime, if anyone out there has successfully motorized either of the turntables above, please post photos and how-to information so the rest of us can see how you did it! Do-It-Yourself slip ring kit. We send you a pre-wired slip ring along with installation instructions. You purchase the drill bit kit listed above, then buy your own turntable (either of the two models above) and install. Installation is quick and easy as long as you're ok using a typical home power drill. Cost for the DIY kit will be $25 with free shipping for Disney Castle lighting kit customers. More information will be coming soon about the estimated date when turntable and DIY will be available. We're going to prioritize delivering our Disney Castle preorders over the turntables until the end of July, so we won't be able to deliver the turntable kits in large volumes until toward the end of the summer. Let us know in the comments if there is interest in having us make a pre-installed kit for the larger turntable. Costs for both the turntable itself and shipping will be higher than the prices listed above, because the larger turntable is both more expensive to buy and heavier to ship (to us and to you). Thanks for your continued interest in the turntable idea! Paul George Coming soon! We're expecting our shipment of connecting cables at the end of this week, which will allow us to start making the slip ring kits. Rob Klingberg Oh, hurrah! And not just because I'm lazy and don't want to break down the susan + baseplate + castle more than once to get the wires through, and finish the install of the castle's MEGA kit . But has given me time to string out some picos in the amusement park area in preparation for the arrival of the castle, the completion of the carousel, and return-to-stock of the Ferris wheel lighting kit. Good times! Paul George Looks great. Just please keep that gigantic pocket knife away from the Stormtroopers! Rob Klingberg so what are the chances of eventually looking into a case for this to go with the turntable as well? I'm not very handy or else id consider doing it myself. Michael Organiscak I know others on the Disney Castle thread have discussed the cases they plan to use for their setups. We haven't tested any cases for our displays, but if others have recommendations to share, we'd certainly be willing to take a look! Just two pennies' worth of perspective, but Michael Organiscak , I'd wager a local plastics shop can whip you up a case in no time flat, and probably faster, quicker and easier than the electrical wizards here (plastic guys know plastics, electrical guys know wires, and sometimes the two intersect, but... those are truly rare critters). In that case, you'd just tell 'em your INNER dimensions, including the turntable and the castle perched on it... and I'd give yourself a few inches extra if you'd ever want to, say, hang Tinkerbell off the side or up the top (we have one there right now). Pays to be flexible. I stumbled across this post as I was looking for a turntable with power so that I could display my Death Star that has a lighting kit installed. Basically what I did was remove the LED light from the centre of the turntable with a craft knife cutting through the moulded plastic. I was then able to pass the cables from the bottom of the slip ring through some screw holes on the bottom of the turntable. I was able to glue the bottom of the slip ring to the bottom of the turntable. The top of the slip ring was the same diameter as the hole for the LED so it fit very well. No friction either. Then just a little electrical tape to tidy things up and some cable ties to collect the cables together and it worked. The only thing I might have done to improve things would be to have utilised the transformer inside the turntable originally used to power the LED and to see if it had enough voltage to power the LEDs in the model. Probably a different transformer module would have done the trick. Then there would only be a single power cable from the turntable to the mains. But for my purposes, it works! Here is a short video showing the Death Star in situ with the lighting kit.